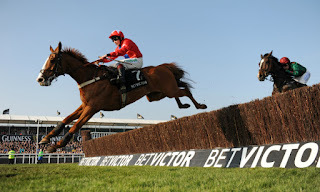 The Mildmay of Flete is the only Grade 3 race that is run on the third day of the Cheltenham Festival. It is a chase race according to British National Hunt classifications. It admits horses of age five years and above to compete over a distance of 4,225 metres (2 mi 5 furlongs) on the New Course. The chase is dotted with 17 fence obstacles that drill the racehorses and jockeys to a near limit. The race has been in existence for over half a decade. The inaugural edition was held during the 1951 festival. It was given its name in honour of Mildmay of Flete who had died a year earlier. Flete had been a commanding figure at the festival, winning thrice in a short career. The first edition will be remembered for having been held in April as the course was waterlogged during the traditional month of March. When nine-year-old horses Slender and Canford finished in a draw during that first race, history was made and the stage was set for one of the festival’s most competitive fixtures. No single horse, jockey or trainer has been able to establish a lengthy dominance in this race. The two-race record is shared by The Tsarevich and Elfast. Fred Winter set the jockeys’ record in 1958 when he won his third race and that record has stood since. Three trainers- Bobby Renton, Nicky Henderson, and Martin Pipe- have a joint record of four wins. This closeness and joint holding of records is a pointer towards the race’s tightness. The race has been run on every occasion since its inception save for the 2001 edition that disrupted the entire festival. The race has taken different prefix names over these years in order to meet sponsor requirements. A purse of around £100,000 for a grade three race is also an indicator of the competition’s stature.